It was a time when people met downtown at the Post Office and shared conversations with friends and business owners. 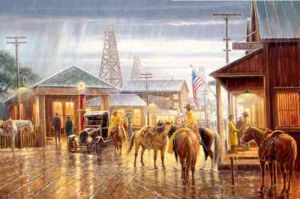 Oil wells meant prosperity for many and jobs were plentiful. The automobile would soon replace the horse as the main mode of transportation and our flag flew proudly as it does today while we are "Remembering The Old Times."